General Manager of Busta Mr. Robert Selman hands over T-Shirts to RHTYSC Secretary/CEO Mr. Hilbert Foster. teams in the Ancient County of Berbice will contest the 11th edition of the Busta Champion of Champions 50-overs cricket competition which was launched on Sunday last. Organised by the Rose Hall Town Youth and Sports Club (RHTY&SC), this tournament which started in 2009 is regarded as the biggest tournament of its kind in Berbice and the organisers have promised that it will live up to that reputation. Club Secretary/CEO Hilbert Foster informed that the other teams that would be challenging the champs for the title are West Berbice, Blairmont, Bermine, Young Warriors, Port Mourant and Upper Corentyne. Action will get started on Sunday November 23 with four first round matches. Upper Corentyne would play the defending champions RHTG&G at the Area ’H’ ground, West Berbice faces Blairmont at Blairmont, Young Warriors and Port Mourant meet at the Cumberland ground while Bermine and Albion engage each other at the Albion ground. Foster noted at the launching that the standard of cricket is expected to be high as most of the country’s top players would be show barring Assad Fudadin, Devindra Bishoo, Veerasammy Permaul, Anthony Bramble and Narsingh Deonarine who would be on national duties. The likes of Jonathan Foo, Sewnarine Chattergoon, Royston Crandon, Jason Sinclair, Jeremy Gordon, Anthony D’Andrade, Raun Johnson, Eon Hooper and Lloydel Lewis will all be on show as they seek to give their respective teams the edge whilst entertaining the expected crowds. 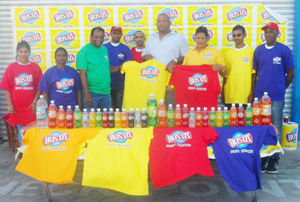 Foster expressed gratitude to General Manager of Guyana Beverage Inc. Mr. Robert Selman and Ms. Shamiza Yadram for their support while pledging that the tournament would be well organised to fulfill all its objectives. The club would be using the tournament to promote its ‘No to Suicide and No to Drugs’ messages to youths. Selman in remarks expressed gratitude to the organizing club for its excellent organizing of the tournament over the years. The Busta brand has been well promoted due to the tournament, Selman noted. The plain spoken Selman encouraged the teams to play the game in a friendly environment and expressed the hope that new talent would emerge. The winner will pocket $100,000 and a trophy, the runner-up $50,000 and a trophy, while the man-of-the-finals would be rewarded with $15,000 and a trophy. The final would be played under lights at the Albion Sports Complex ground and carried live on NCN Radio.